Of the many metrics that we use to measure our travels, one of them is to visit the state capitol buildings of each of the states. To date we have had the pleasure of visiting eight of them (SC, VT, PEI, NY, RI, CT, MA, and OR). 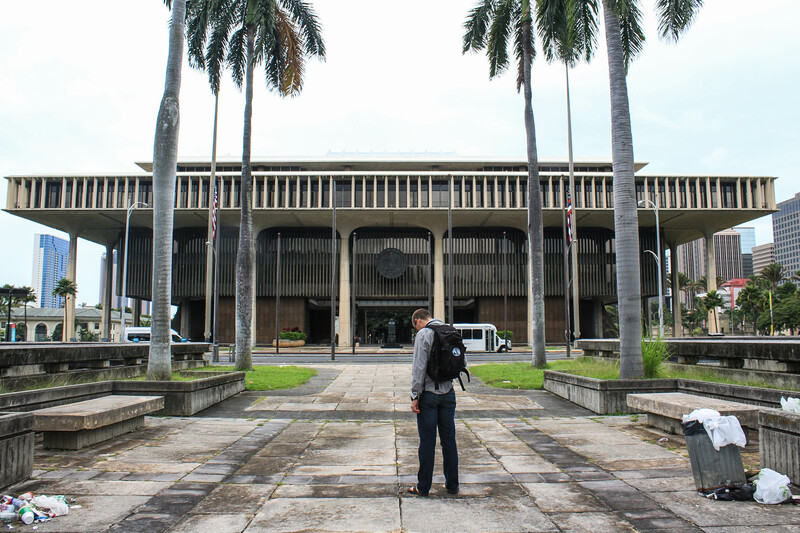 Here on Hawai’i we have a two-for-one on Hawaiian capitols. There is the modern looking State House and the much more elegant Iolani Palace. 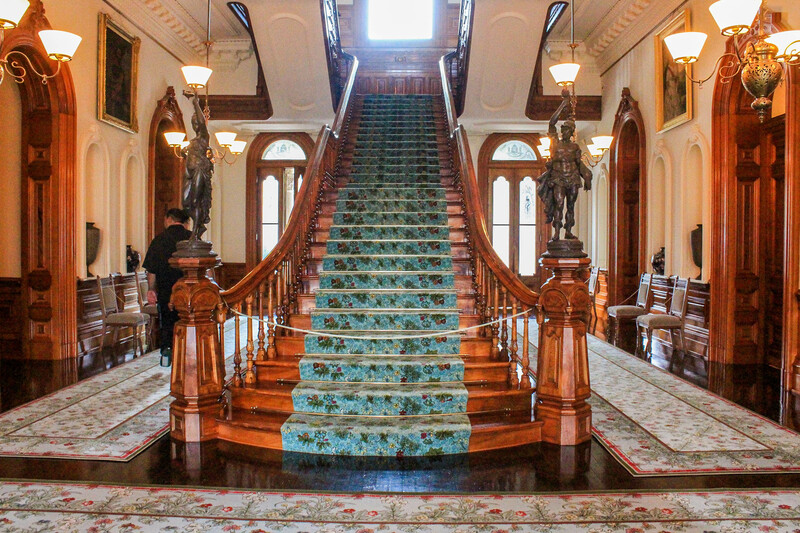 Normally there are no tours of the capitol building, and tours of the palace are twenty some dollars, but on the second Sunday of every month the Iolani Palace is free for Hawaiian Residents and Military. We made plans to go hike Diamond Head early in the morning and then visit downtown Honolulu, but the Navy quickly changed those plans, and I had to go in early Sunday for a couple hours. Our hiking plans were off, but perhaps for the better. It turns out that there was a half marathon going on around Waikiki and getting to Diamond Head would have likely been difficult with closed roads in that area. After getting off work, we drove to downtown Honolulu and drove in circles awhile, finding all the parking garages to be closed, before realizing that street-side parking is free on Sundays. We parked directly in front of the Palace and got our tickets for a guided tour. There is a self-guided tour available, but I’m not sure how informative that would be if you’ve never visited prior. With the tour guide you get a great history lesson and unlimited questions. 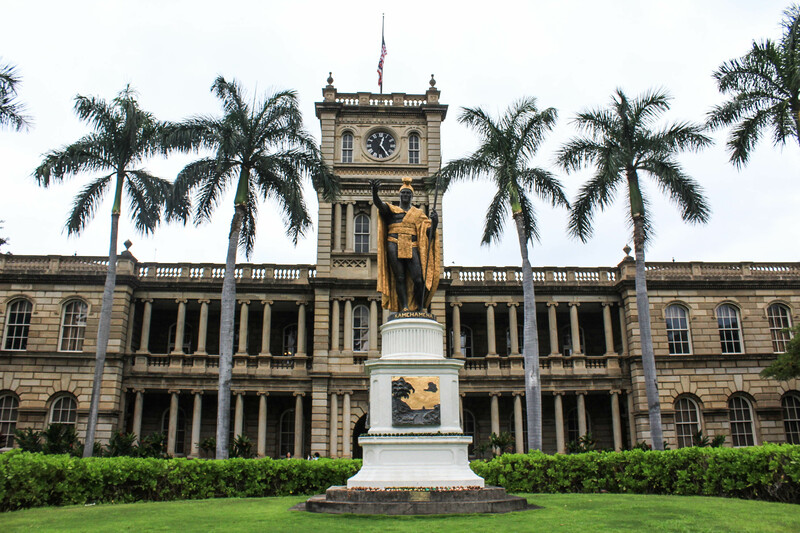 And now, for the history we learned from touring: The Kingdom of Hawai’i begins in 1795 when King Kamehameha I defeated his adversaries at the Pali Notch above Nu’uanu Valley on Oahu thus unifying the islands of Oahu, Maui, Molokai, Lanai, and Hawaii. Kauai and Ni’ihau joined the Kingdom voluntarily in 1810. The Kingdom was ruled by Kamehameha and his direct descendants for five generations, with each successive generation feeling the external pressure of European and other Asian empires. After King Kamehameha V died without leaving an heir, his cousin Lunalilo was elected from the remaining Hawaiian nobility. Lunalilo, while a popular King, died within 13 months of taking the throne. Leaving no successor as well, a second election was held and King Kalakaua was proclaimed king. 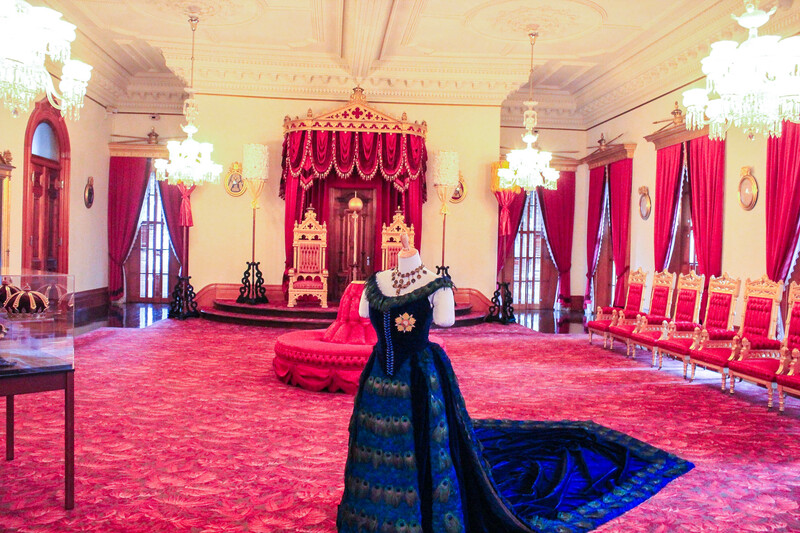 King Kalakaua did many things for the Kingdom including including circumnavigating the globe and building the Iolani Palace, a modest palace by European standards but an elaborate and elegant home for the royal family. In the entrance hall, the visitor is introduced to a large Koa Wood grand staircase. Among the royal gifts lining the walls are portraits of all the previous Kings of Hawaii. Off to the left, the banquet hall and ‘drawing room’ and to the right, the Royal Ballroom. On the second story, the palace was divided into a Queen’s Side and the King’s side. King Kalakaua met many royal dignitaries and representatives in his home and many gifts were exchanged. But during his reign, the rule of Hawaiians became less and less as non-Native European and American residents ‘forced’ the Kingdom to increase ties with the Western Powers. Then in 1890, King Kalakaua made a trip to San Francisco to visit Washington D.C. to discuss tariff matters with the president. While there, the King died of kidney failure propelling his sister Lili’uokalani onto the throne. The Queen, loved by her people, maintained the throne for only two more years. Then, in 1893, the Queen attempted to rewrite the constitution to regain rights for Native Hawaiians and gain further independence from the United States. But the non-Natives would not have it. And when word leaked of the Queen’s plan, the Committee of Safety, an ‘American Club’ set on American Annexation of Hawaii, formed a coup and overthrew the Queen, removing her from her own palace. The Committee of Safety installed a provisional government believing the American Government would quickly annex the islands in the name of American interest. But, even though US Marines landed and secured the American Embassy, President Cleveland, opposed to American expansionism, refused to annex the Kingdom. The Committee, left without the support they felt they deserved, formed the Republic of Hawaii while they waited for an eventual change in Washington’s politic. That wait would take four more years before McKinley would make Hawaii into a territory. During that time, in January 1895, a rebellion against the new government by the native population broke out in Honolulu with the intent of reinstating the queen. 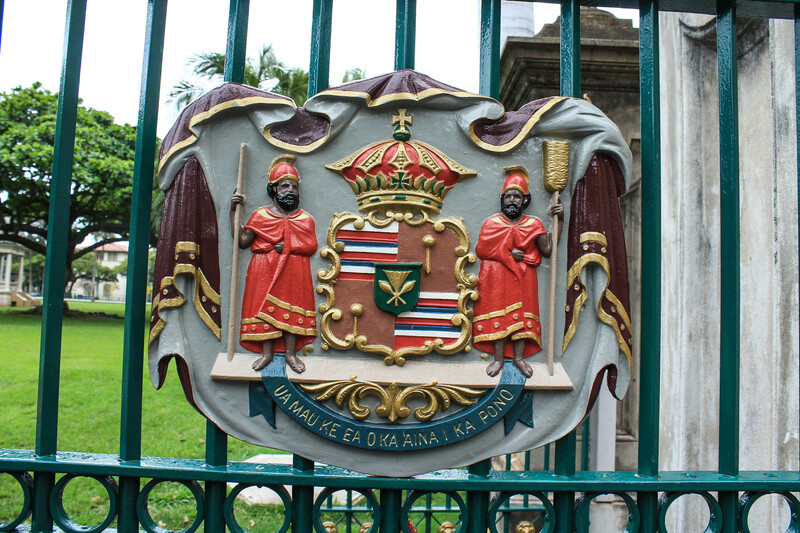 The rebellion was unsuccessful and the government, believing that Queen Lili’uokalani had been responsible, sentenced her to imprisonment inside Iolani Palace for five years. This sentence was later commuted to only eight months, but during that time the Queen composed songs, wrote to her people and supporters, and sewed a large ‘grief’ quilt, now on display in the palace. We were able to tour the majority of the palace, and the tour lasted an hour. The palace/museum has also come a long way since the Kingdom was overthrown. When the provisional government, and later the Republic was in power, they occupied the palace and removed or sold most of the royal trappings. It has only been over the course of almost 50 years that the museum has been able to recollect many of the original pieces that once belonged to the King and his family. Afterwards, we wandered around the general vicinity, circling the current state house, Washington place (Queen Lili’oukalani’s personal home and the current Governor’s mansion), the City Hall, the first church on Oahu, and Ali’ioni Hale (the Hawai’i Supreme Court) with the King Kamehameha Statue in front. All of this made for an enjoyable couple hours downtown Honolulu. Note from Jess: I can’t help but laugh at this silly picture of the capitol building. I didn’t realize how much trash there is in the picture, and then there’s Curtis looking dejected at the sight of it all. 🙂 I guess Oregon doesn’t have the worst state capitol building after all!